In this section of the report, we tackle the topic of fires. Which is more at risk of fires — gasoline cars or electric cars? Well, of you know the answer — it’s in the title. EV Risks? Or Not So Much? Below is a summary of topics considered to be of potential risk with electric vehicles. We’ll dive much more into the first topic in most of this article. ⇒ Highly mediatized accidents involving fire especially three Tesla Model S accidents. ⇒ However ICE cars are fundamentally more exposed to fatal fire risks than their electric counterparts, as the deadliest fires are mostly due to flammable liquids located in the engine area. ⇒ Hybrids and electric vehicles are so quiet that pedestrians can’t always hear them coming. NHTSA last year finalized a rule requiring the vehicles to make noise but has since delayed the effective date. ⇒ Fires that originated in the engine area were by far the deadliest: 34% of all deaths. ⇒ Fires that originated in the fuel tank accounted for only 2% of all highway vehicle fires but 13% of fatal highway vehicle fires and 14% of deaths. ⇒ The leading factor contributing to the ignition of highway vehicle fires was mechanical failure (44%). ⇒ First ignited items in fatal highway accidents: Flammable liquids and gases were the most deadly (63% of deaths). ⇒ Fuel in or from the engine area was the second leading item first ignited in all highway vehicle fires (18%) but was, by far, the leading item in both fatal fires (36%) and deaths (37%). ⇒ FARS1 to determine the characteristics of fatal crashes. ⇒ NASS/CDS2 to explore the factors associated with injuries. ⇒ NASS/GES3 used for computation of exposure in this study. ⇒ Cars, light trucks and vans only. 1 Census of all traffic fatalities in the US. 2 Sample of ~4,000–5,000/year in-depth crash investigations with exhaustive details on injuries suffered. 3 Database of 60,000 crashes/year sampled from US police reported crashes. 4 Abbreviated Injury Scale (AIS) ranks injuries on a scale of 1-6 based on the threat to the life of the occupant. AIS1 is a minor injury and AIS6 is an unsurvivable injury. Light blue = hybrid vehicles. Dark blue = conventional gas vehicles. ⇒ In fatal vehicle crashes extracted from FARS, incidence of fire was found in 2.6% of hybrid vehicles and 4.4% of conventional vehicles. ⇒ Vehicle fire was also very rare in NASS/CDS: no hybrid vehicle in the sample experienced a vehicle fire. 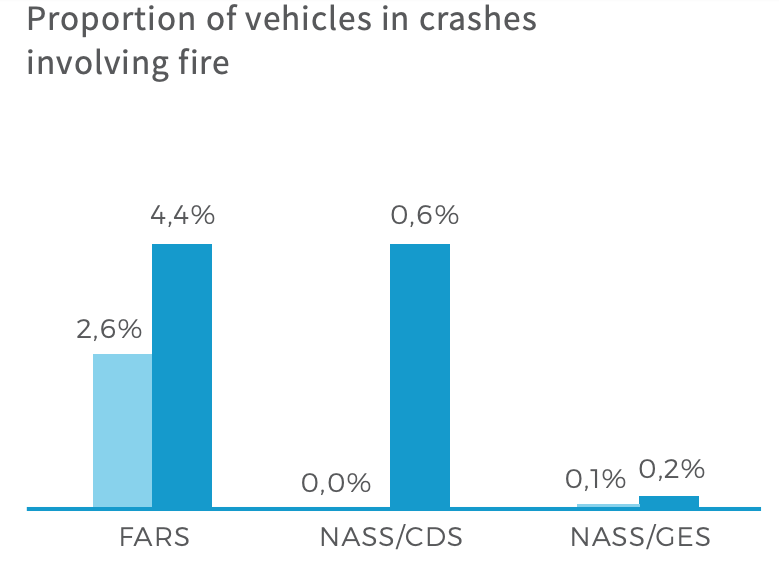 ⇒ Similarly only 0.05% of hybrid vehicles in the NASS/GES sample were involved in crashes with fire incidences. ⇒ No case of electric shock was found in the dataset for either hybrid, electric or conventional vehicles.